Poor Michele Bachmann can't catch a break. It makes you wonder if Sarah Palin is holding out on announcing her candidacy just so Michele Bachmann can serve as the whipping post for a bit. On the heels of her latest gaffes, Bachmann told CNN, "I’m a substantive, serious person and I have a strong background...I'm introducing myself now to the American people so that they can know that I have a strong academic scholarly background, more important I have a real life background." Yesterday, Bachmann had a little bit of a run-in with a convicted serial killer. As you've probably heard by now, Bachmann, while in Waterloo, IA, told a Fox News reporter, "Well what I want them to know is just like John Wayne was from Waterloo, Iowa. That's the kind of spirit that I have, too." John Wayne wasn't from Waterloo (he was from Iowa, but three hours away in Winterset), but killer clown John Wayne Gacy lived, worked, and killed there. If Bachmann were a scholar, she might have avoided the John Wayne comparison altogether. Anyone who had followed John Wayne beyond his screen appearances would have been aware that he was an ex-socialist WWII service-avoider who said "I believe in white supremacy..."
As if her day couldn't get any worse, Tom Petty is reportedly issuing a cease and desist letter for her use of his song 'American Girl' during her rally. The song, it has been noted, was also sung by the kidnapped politician's daughter was in "Silence of the Lambs." Michele Bachmann, the scholar, appears not to have studied the lyrics to many of the songs played during her rally (and don't be naive, those songs are not pulled out of a hat). The Atlantic has compiled a list of questionable lyrics from the songs, which included "Start Me Up," "Let's Get Loud," and "I Got You (I Feel Good)." Bachmann has also been using Katy Perry's 'Firework,' which anyone knows, unless you live under a rock, is somewhat of an LGBT anthem. 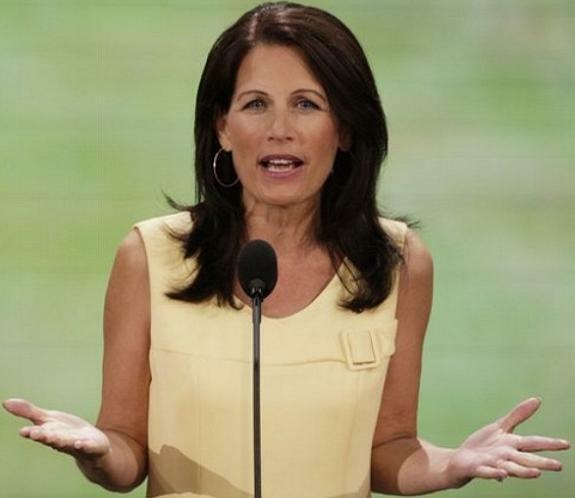 Bachmann the scholar, is ridiculously anti-LGBT. As Richard Roeper stated, "'Firework' is "all about acceptance and tolerance and celebrating our differences. Perry dedicated the video (which has nearly 200 million views on YouTube) to the “It Gets Better” campaign, which is dedicated to fighting harassment of gays and lesbians." Of course, all of this will lead Bachmann and her supporters to decry the "lamestream media" as sexist haters who are ready to put her every move under a microscope. Sound familiar? Hold on, folks. We're only one day into the 'official' Bachmann campaign. There's a whole lot where yesterday came from.